× two = 6 Required Please enter the correct value. In a world where bigger is often deemed better, the goliath multinational conglomerate is getting smaller. And Wall Street approves. The Fairfield, Conn.-based company will also shed nearly all of its real estate portfolio for $26.5 billion. Buyers here include Blackstone and Wells Fargo. GE said it would bring back some $36 billion in cash currently overseas as well. Additionally, the GE board authorized an enormous $50 billion share repurchase program. The buyback is the second-biggest ever. Apple Inc.'s (Nasdaq: AAPL) $60 billion is tops. "This is a major step in our strategy to focus GE around its competitive advantages," Jeff Immelt, GE's chairman and chief executive, said in a statement. "GE today is a premier industrial and technology company with businesses in essential infrastructure industries." The move marks a pivotal moment for GE. In fact, when Immelt tweeted the news around 6:30 a.m. Friday, the link he included was GE.com/pivot. GE's unit sales, repatriated cash, share buyback, and dividends are expected to return some $90 billion to shareholders through 2018. Over the last several years, it has trimmed its media, financial, and appliances units. Meanwhile, GE has been bulking up on its industrial manufacturing business. The goal is focus and simplicity. The company's market cap is still a whopping $277.76 billion. But today's GE Capital deal is the most significant. The arm nearly toppled the company during the depths of the 2008 financial crisis. 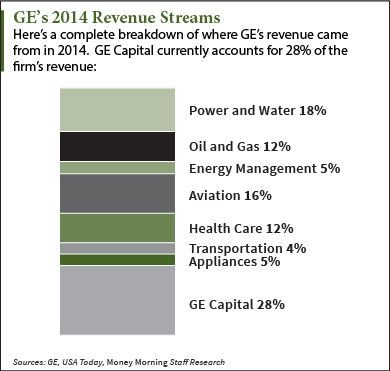 Last year, the segment accounted for 42% of GE's earnings. By 2018, the unit is expected to make up just 10% of the company's earnings. We alerted investors to the profit potential of GE stock last month, and the stock remains one of our favorite blue-chip stocks to buy and hold in 2015.